As Bing gains momentum and the Bing Network grows around the globe with 31.9% share in the United States, 23.3% in the United Kingdom and 14.1% in Australia Microsoft, Bing's open partnership approach continues to foster valuable business collaboration with agencies, technology partners and SMB partners to achieve more together. Today, we are excited to announce the expanded Bing Partner Program recognizing partners who have proven to be trusted advisors to their clients and have an in-depth understanding of search advertising. These qualified Bing partners are uniquely committed to providing the highest quality of service, technology and expertise to ensure their clients see success in search advertising. The new expanded program is available to partners in the United States, select customers in Australia, Singapore and India, and will soon be extended to Canada, Brazil, and our 14 European markets. 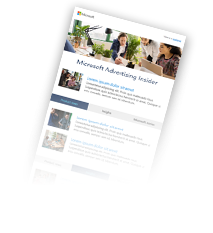 At its core, the Bing Partner Program is a relationship between Bing and the most competent and qualified partners in the advertising industry to ensure our current and future clients exceed in their goals. To qualify, partners must meet specific criteria with requirements on training, Bing Ads accreditation and business volume. Partners then receive extensive benefits including training, access to the latest Bing and Microsoft technology and APIs, marketing support, recognition with a Partner Program badge and visibility in our Partner Directory. The new program also allows our top partners, who have proven their commitment to Bing and their clients over time, to distinguish themselves as Elite Partners. The Elite Partners have higher certification, volume and engagement requirements, and work closely with Bing to shape our roadmap. These partners receive access to exclusive events, in-person trainings, dedicated account management, and deeper engagements with our engineering teams. They additionally get access to industry research, consumer trends, vertical insights, and co-marketing investment. Benefits may vary by geographical region to ensure we deliver the most locally-relevant experience to our partners. Microsoft and Bing Ads are committed to providing world-class service to our customers and partners around the globe to empower them to do more. If you think you qualify, and are interested in becoming a Bing Partner, please talk to your Bing Ads representative, or write us at bingpartners.com.